This is a story of over 4000 Irish orphans driven from their homeland by the Great Famine. In the years 1848 to 1850, a total of 4114 orphan girls, some no more than 14 years old, were shipped on government funded immigrant vessels from Ireland to Sydney, Port Phillip, Moreton Bay and Adelaide. Many, though not all, spoke English although few were trained in domestic service, the work in which most would find employment. Known as the ‘Irish orphans’, they had been handpicked by government officials and removed from county workhouses grown horribly overcrowded as, year after year, the Irish countryside sank deeper into poverty, misery and disease. To manage the orphan arrivals in Sydney, an immigrant depot was set up at Hyde Park Barracks. In its newly plastered and painted rooms were added rows of heavy iron beds, replacing the old convict hammock frames and tattered hammocks. In some areas, ceiling boards were fitted, eliminating drafts and creating comfortable sleeping wards. Downstairs offices were remodelled and furnished for immigration business. While the orphan scheme itself was shortlived - swept aside by popular protest - other programs of sponsored emigration, along with the discovery of gold, continued to lure hopeful travellers, reunite families and boost the colonial workforce for decades to come. This fleeting chapter in Australia’s immigration history looms larger than most. It weaves together Ireland’s harrowing years of famine, its spirited culture and countryside in turmoil, its families torn apart, an endless diaspora of desperate people with hopes of a brighter future beyond the seas. By 1848, the famine's death toll had reached one million, with around one in five deaths occurring in a workhouse. As diseases like dysentery, typhus, cholera and scurvy swept through the overcrowded and unwelcoming institutions, inmates were forced work for their keep breaking rocks, building roads and carrying out other heavy, often pointless, physical tasks. Behind the scheme to relieve Ireland of its crowded workhouses and ship needy orphans to the colonies was the politically progressive Earl, Henry George Grey, Secretary of State for the Colonies (1846–1852). His vision was twofold: youthful lives spared of misery and the ex-convict colonies enriched with hardy, humble, fertile females. The selection process was simple. The girls had to be young, single, obedient, healthy and free of smallpox. Earl Grey had originally hoped that orphans would be drawn from pauper institutions operating throughout Britain, although for unknown reasons only adolescent, unmarried girls from Ireland were despatched. Transport and processing costs were shared between the English government and Irish Poor Law Unions. Just as important was support from the colonies to ensure secure and comfortable housing and efficient hiring facilities, once the girls were brought ashore. Initially the scheme looked promising. Reporting to London in 1848, immigration agent Frances Merewether was optimistic that, ‘provided the Emigrants were of useful description … three ship loads, or about 700 Statute Adults … might be despatched to the Sydney District each month’. With minor alterations and expense, the spacious old prisoner barracks with its high-walled compound and outbuildings could offer ‘ample and most comfortable accommodation’ for the Irish orphans. In Australia, decades of convict transportation had left the colonies with a serious shortage of women. Teenage girls were vital for raising families while female servants and workers were needed in aspiring colonial households. However, without supportive networks or family, the girls remained vulnerable and powerless to control their fate. Mostly uneducated, unworldly and unused to domestic service, the orphans relied on protective officials to negotiate their place in the labour market. And costing less to hire than more experienced servants they generally found work quickly. Despite low wages, some sent savings home and funded family reunions. ... provided the Emigrants were of useful description … three ship loads, or about 700 statute adults … might be despatched to the Sydney District each month. Before they left Ireland each orphan girl was given a regulation kit of clothing, linen and utensils stored in a lockable box. The girls shared bunks in third-class quarters and mustered in small mess groups. Each shipment was overseen by a surgeon-superintendent and a matron, who guarded against contact with sailors and fellow passengers. After several months at sea, the immigrant ships were towed into Sydney Cove, unloading their passengers on the dock like so many human parcels. The orphan girls, strangers in a strange place, along with the motley assortment of unaccompanied women and mothers with children, were carted on drays or walked up Macquarie Street to the Immigration Depot at Hyde Park Barracks. In the following three years a total of 2253 orphan girls were lodged at the Barracks. Scrutinised by immigration clerks, health officers and clergy, they shared sleeping quarters in the newly-appointed wards upstairs, before signing indentures for work in the ground floor hiring room. Elsewhere in the building, separate areas were appointed for regular shiploads of immigrant women. Immigration officials saw the Barracks as shelter for 'unaccompanied' females, along with the wives and children of convicts, 'sent out to their husbands or parents'. From the first arrivals in 1848, and for years afterwards, the orphan girls confronted heated local hostility. In the background, moves towards colonial self-government had already kindled fears of a mobbish Irish majority, and Earl Grey’s support for the revival of convict transportation had won him few friends in the colony. Initial antipathy towards the orphans centred on their youth, incompetence, lowly workhouse origins and, most of all, their Irishness. Coupled with inexperience in household service, according to one Sydney official, was ‘their disinclination to learn, their dirty and idle habits’ along with, in some, ‘a morose and ungovernable temper’ . Even worse, as future mothers, the girls threatened to imperil the supposedly vigorous colonial physique, with ‘their squat, stunted figures, thick waists and clumsy ankles’. Prejudice and ridicule, however, was nothing new. Irish women had long been branded low-class, licentious and unruly in the colonial press, and the notoriety of some recently arrived free Irish women revived locals’ suspicion, while politicians and Protestant clergy feared a growing Irish-Catholic majority. Yet despite a perception that the colony was awash with 'workhouse sweepings', most orphan girls found employment within weeks of arrival. Many proved to be suitable workers. Around half of the girls married older protestant Englishmen. Apprenticeships to middle-class families often meant years of hard, low-paid work as maids, kitchen hands and mothers helpers. Their tendency to have large families of their own seldom made life easier. As gold and outlying land releases pushed European farmers further into the interior, the orphan girls were well represented in harsh and isolated pioneering settlements. The orphan girls, strangers in a strange place, were carted on drays or walked up Macquarie Street to the Immigration Depot at Hyde Park Barracks. As gold and outlying land releases pushed European farmers further into the interior, the orphan girls were well represented in isolated pioneering settlements. While waiting to find work, the orphan girls spent their days occupied with routine chores and their nights in the sleeping wards upstairs. Apart from interviews with approved employers, outside contact was limited to visiting health officers, local clergy and nuns of the Sisters of Charity, who offered advice, prayer and literature, and pressured the Matron for better treatment. Given it cost the same to ship experienced immigrants to the colony, many began to wonder if the drain on colonial funds was worth it. By 1850, as orphans arrivals increased were offloaded at Sydney Cove and the Barracks grew periodically crowded with un-hireable inmates, anger arose over the expense of housing them in the depot. Unlike the Scottish or English women in transit at the Barracks, the Irish orphans were forced to pick oakum – unravelling old ropes for wadding – under guard in a so-called ‘refractory room’. The customary coldness of 19th century charity, it seemed, took a more punitive turn. According to immigration agent Captain HH Browne, whose antipathy towards the scheme was well known, singling out the Irish girls for punishing work was necessary, given the ‘general complaint at the time was that they were treated with more consideration than they were entitled to and rather unduly encouraged to remain in the building’. Maria, the last ship to transport Earl Grey’s orphans, docked at Sydney on 1 August 1850. Unable to withstand such heated opposition, the workhouse scheme was abandoned. Two years had seen a few thousand orphans find their way into new, sometimes better, circumstances. Many more remained behind in Irish workhouses. Government-assisted female immigrants from Britain continued to lodge at the Barracks until 1886. Of the thousands of orphan girls bundled through the Barracks in the wake of the Irish famine after 1848, most disappeared into colonial life, leaving little trace of their ordeals and conveniently burying their stories. 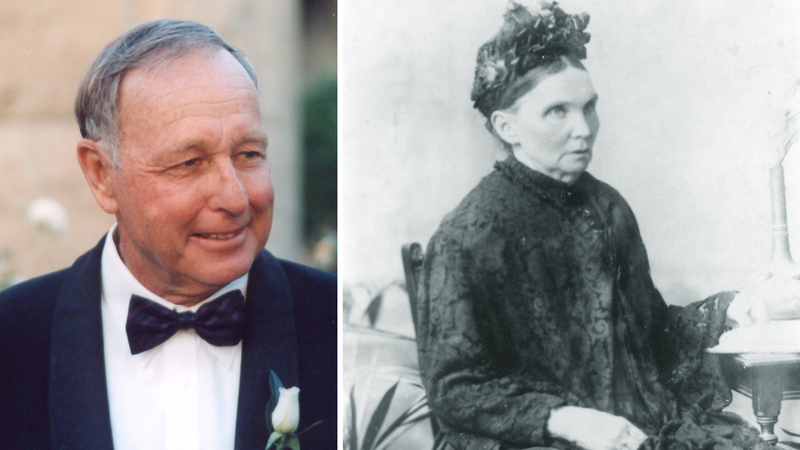 In recent years however, a growing number of family historians have begun to unearth connections across the generations, bringing to light fascinating tales of young women making new lives in the colonies and establishing, sometimes, vast family networks. Other kinds of traces were discovered under the floorboards of the Barracks, when archaeologists were brought in to investigate and scour the building ahead of museum renovations in the early 1980s. The following gallery highlights how personal tales and archaeological relics connect us to the struggles and triumphs of these trail-blazing women. Sisters Eliza and Catherine Dooley and their cousin Ellen travelled from the Parsonstown Union workhouse in County Kings, arriving in Sydney on the Tippoo Saib in July 1850. Eliza, the youngest, was 17. Her parents, from Kilcoleman, were dead. An uncle remained in the workhouse. Staying briefly in the Barracks, Eliza found work as a nursemaid in Maitland and in 1854 married an Englishman John Blanch, eventually raising 13 children. Within a decade the couple had acquired the ‘Royal Oak Inn’ on the Uralla gold diggings near Armidale. At one time terrorised by the bushranger ‘Thunderbolt’, whose inquest took place in her Inn, Eliza remained in Uralla until 1891 before moving to Armidale where she died, aged 80, in 1912. Fifteen-year-old Mary Kenny sailed from Plymouth on the Lismoyne, landing at Sydney in November 1849. Both parents were dead at the time she left Castlecomer, County Kilkenny. Quick to find work in the colony, her marriage to the Hornby Lighthouse keeper Henry Johnson in 1852 found her living at South Head. Their son Alfred later operated the Macquarie Lighthouse. She may have assisted her brother John, a Royal Marine who’d lost a leg in action, to emigrate to Sydney in 1870. 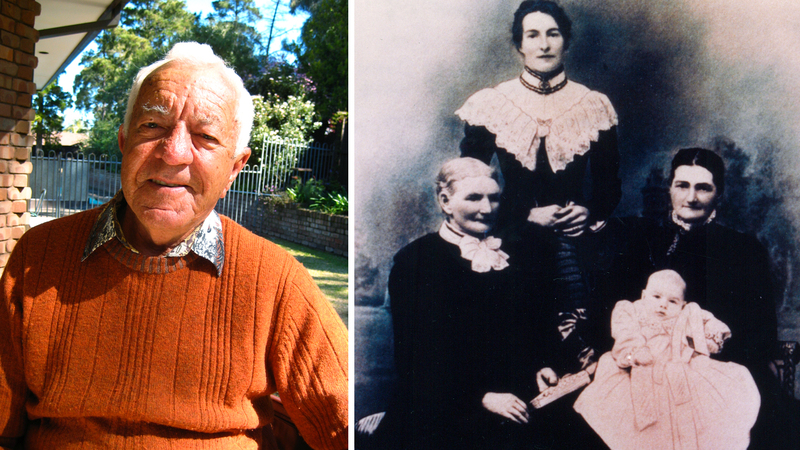 Mary died at Watsons Bay on 20 June 1913, aged 78. Isabella McDougall, aged 16, of Banbridge workhouse in County Down, sailed on the first of Earl Grey’s orphan shipments, on the aptly named Earl Grey, landing at Sydney in October 1848. 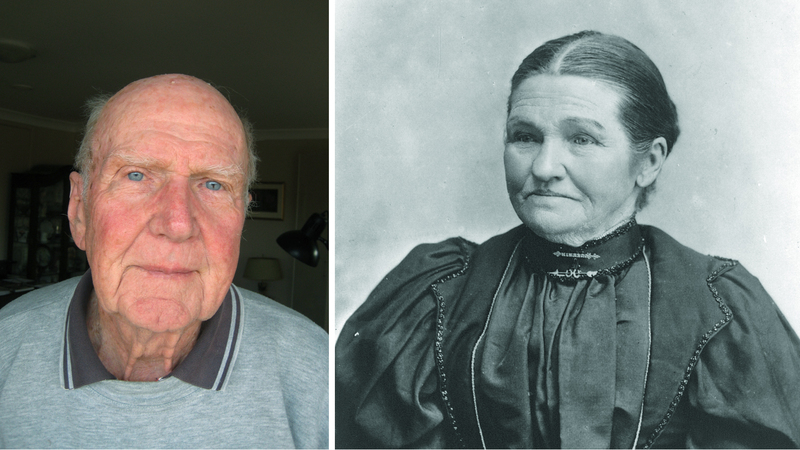 Transferred to the Maitland depot, Isabella found work as a nursery maid until marriage to ex-convict Edward Spicer in July 1849 took her firstly to Armidale and eventually to Newstead station near Inverell, where her husband worked as a shepherd. Isabella had 13 children before Edward’s death in 1872. To support her family, Isabella worked as a boarding house mistress in Inverell before marrying again, this time to Swan Vale farmer Angus Mackay. Isabella died on a visit to Glen Innes in 1904. Hannah, or Honna, Rafferty was 17 when she arrived in Sydney in April 1849 on board the Digby. 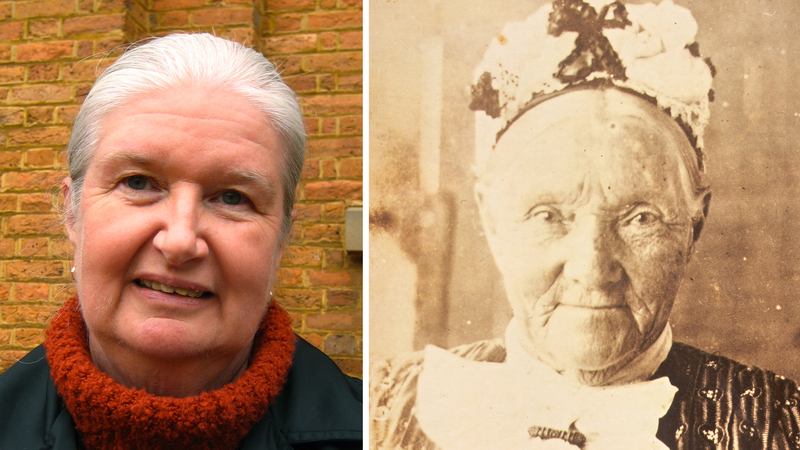 Her mother and father had died either before or during her stay at the dismal Castlerea Workhouse in County Roscommon. She was transferred to Bathurst in November 1849, probably after misconduct at Hyde Park Barracks. A year later, Honna married goldminer Charles Edwards at Holy Trinity, Kelso, and raised seven children before his accidental death in 1866. Details of her second marriage, to Frank Green, remain unclear. Hannah died on 24 May 1900, aged 66, and is buried in Bathurst. Visiting the grave of Hannah Green (nee Rafferty and nee Edwards) in the Bathurst cemetery. Although clothed, fed, freighted and lodged at British government expense, the orphan girls knew few luxuries. Thrift, economy, toil and creativity were encouraged in institutional life. Broken or worn out things not easily replaced, like socks and smoking pipes, were carefully mended, while things not easily acquired, like game pieces, pegs and hats, were cleverly improvised. 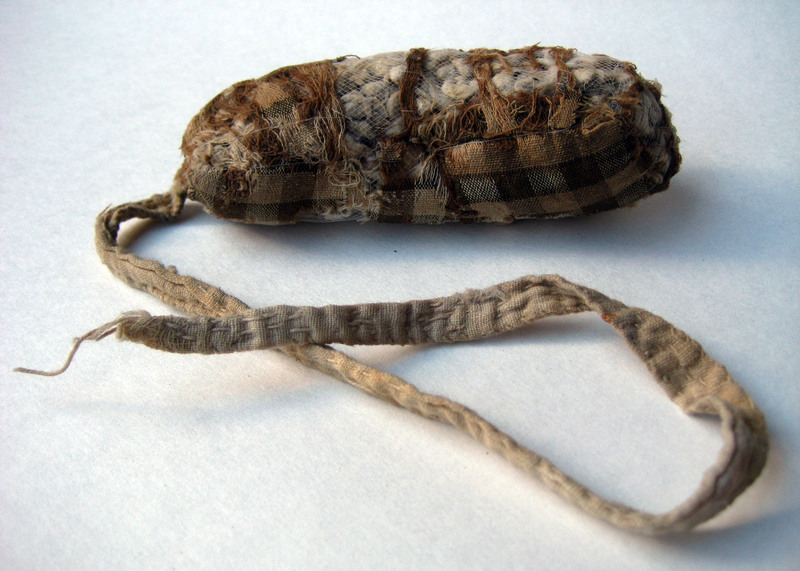 OBJECT: Pin cushion, made from chequered brown fabric, used by 19th century occupants of the Hyde Park Barracks and discovered under floorboards by archaeologists in the early 1980s. According to instructions, 'Monday and Tuesday shall be the usual washing days, but this rule will not be held to apply to Immigrants received into the Institution from ships on or subsequent to those days'. We can only imagine how the endless battle against infections, infestations, tooth decay and grime overwhelmed the lives of depot inmates. 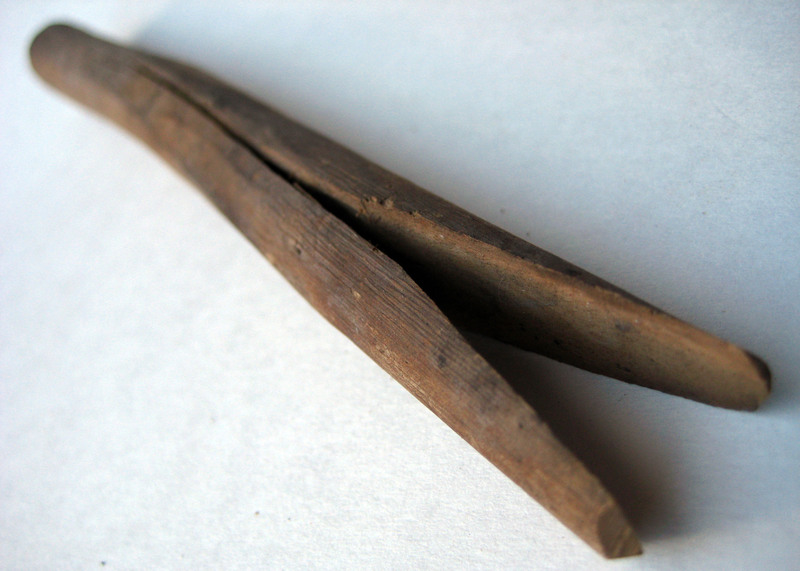 OBJECT: Clothes peg, improvised from length of timber, used by 19th century occupants of the Hyde Park Barracks and discovered under floorboards by archaeologists in the early 1980s. Discipline and order at the dining table was strictly enforced by the Matron, who oversaw the rationing of the orphan girls’ meals. Compared to their former workhouse diet, commonly of boiled Indian meal, a nourishing stew of beef or mutton, along with salt, tea and fruit, confirmed the government’s desire to hire out fit, healthy and well-fed girls. 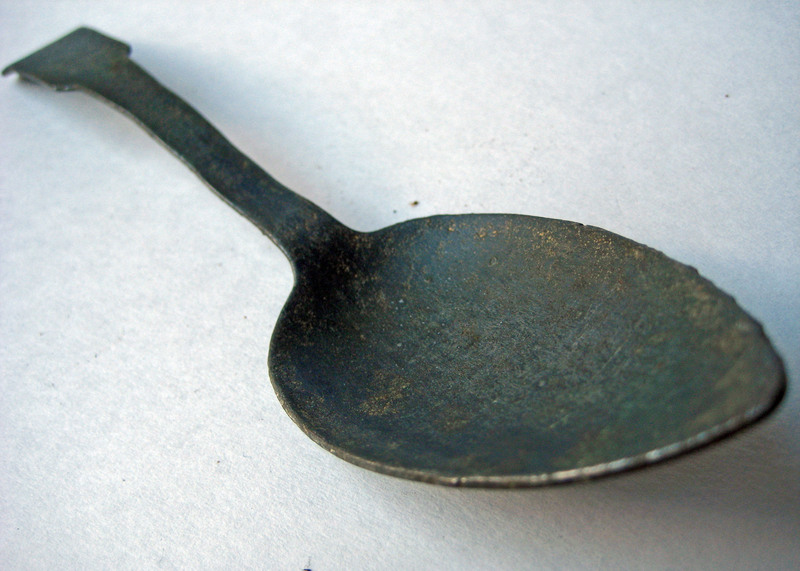 OBJECT: Spoon, used by 19th century occupants of the Hyde Park Barracks and discovered under floorboards by archaeologists in the early 1980s. According to a some outspoken colonists, the orphan girls apparently ‘preferred food and lodging and idleness in that establishment to wages and labour out of doors’. So how did they pass these supposedly wasteful idle hours? Handy use of a pocket knife, crafting scrimshaw motifs on a piece of bone, the initials of a loved one in wood, playing dice or dominoes, stealing a quiet smoke or reciting a private rosary. 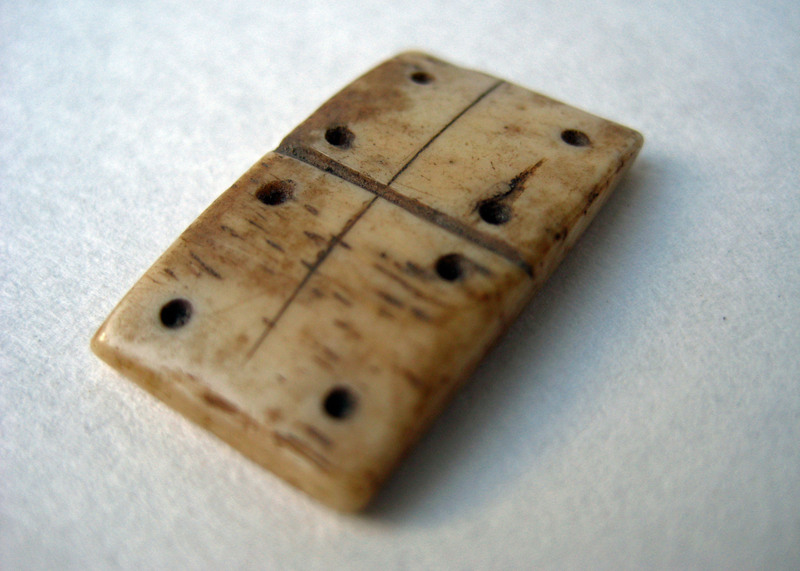 OBJECT: Bone domino game piece, used by 19th century occupants of the Hyde Park Barracks and discovered under floorboards by archaeologists in the early 1980s. While many of the orphan girls were hired quickly, others faced weeks of monotonous drudgery. Routines of depot life revolved around daily cleaning and scrubbing, weekly baths and monthly menstrual work. Distractions were few. Perhaps the prayer books, pious magazines and visits from the Sisters of Charity and local priests relieved the boredom. 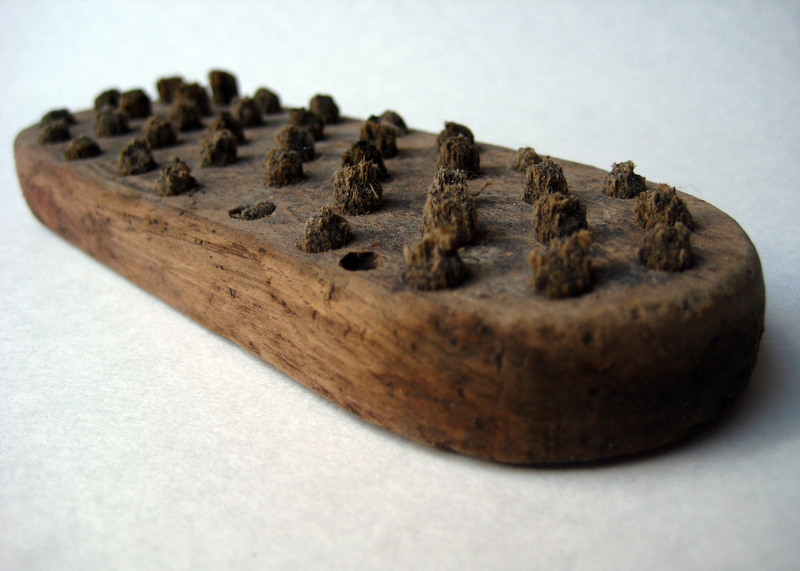 OBJECT: Brush, used by 19th century occupants of the Hyde Park Barracks and discovered under floorboards by archaeologists in the early 1980s. What’s needed for life in another world – a precious set of rosary beads, a lucky coin tied in a hanky, a sacred heart, the blessed virgin, a tiny keepsake box? On departure from Ireland, the girls were kitted with clothing of various patterns, to equip them for travel and to camouflage their workhouse origins. Facing an unknown fate, they inevitably stowed other precious or useful things like these. 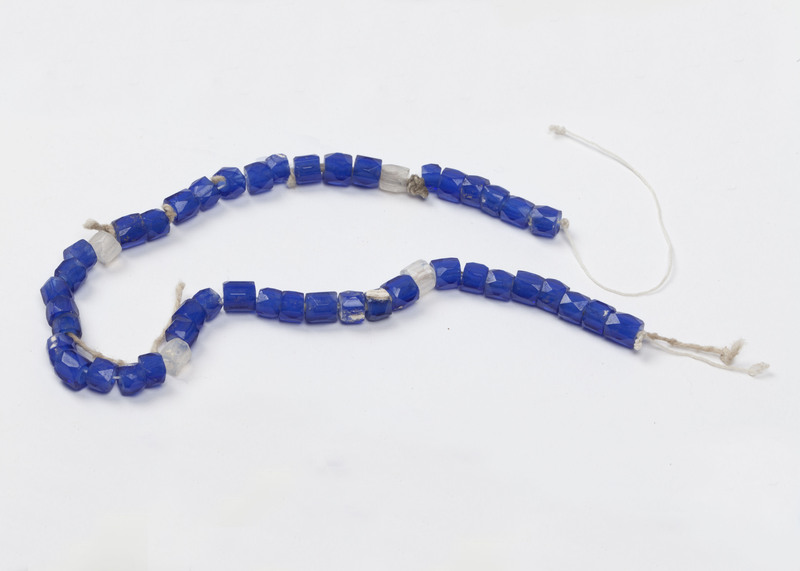 OBJECT: String of blue glass rosary beads, used by 19th century female occupants and discovered under floorboards at Hyde Park Barracks by archaeologists in the early 1980s.